All in all it’s a glory and a fitting monument to the will do, altruistic determination of the common man. Inside its dimly serene and oozing with the welcoming, steadfast, nurturing warmth that only wood can provide. It’s the kind of structure that you want to hug just because it’s there. 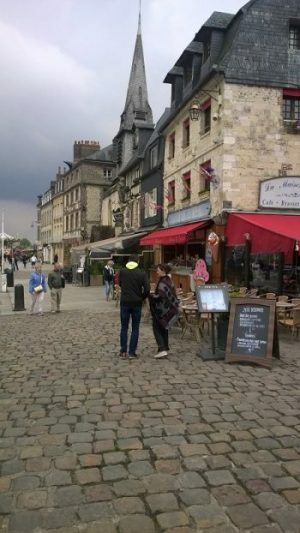 I could have happily lingered longer, but as so often happened on our trip, advancing age found itself needing a nap and the husband’s spine had been jostled to whinging point by the horse drawn tour of the cobbled back streets of the town. But all that paled into insignificance when we discovered Chocolate Street. The French have a way of building up, creating buildings that feel taller than their multiple floors, as often as not with attic rooms. Even in the villages and hamlets most houses have three floors. This multi floor concept, becomes loftier in the towns (pun intended) where the streets are lined with incredibly thin houses and apartment buildings standing shoulder to shoulder. The habit seems to be a hangover from the Romans who housed the impoverished masses in 4 or 5 storey apartment blocks made of wood. St Catherine’s harbour in Honfluer, an enclosed square lake of sea water lined by soft toned 6 or 7 storey apartment blocks with brightly coloured canopies shading the ground floor shop windows, was perhaps the fairest of all the examples of French upbuilding we saw. While we were there they were renovating the old harbour building standing sentry like on the bank of the harbour guarding a golden fairground carousel and a tree lined cobbled walkway to more picturesque restaurants, cafes and shops. 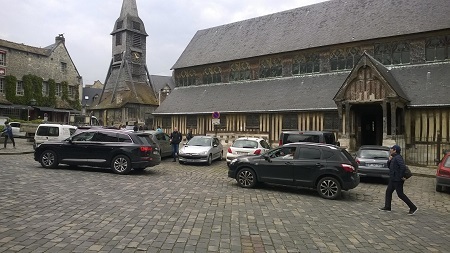 It was on one of these cobbled streets, rising up from the harbour toward St Catherine’s church that we dubbed Chocolate Street’. Chocolate Street was end to end sugar, the gold reflected light of sweetie wrappers bouncing off the glistening smooth chocolate shades of the husband’s favourite treat, guaranteed to stem the pain of a shattered spine. As a diabetic I could only stand and reminisce about the pleasure of slowly stripping a mars bar and take comfort in a stack of tins of flavoured sardines we bought in the speciality fish shop nearby. Had I been hungrier we would have stopped for a plate dripping with seafood, but I have to admit that being offered fish and chips put me off (seriously!). In my opinion there is something fundamentally wrong with travelling to a foreign country famed for its gastronomy and finding restaurants advertising fish and chips in English. Or having the chef complete with hat on the Ferry offering to serve me some with a heavy French accent. 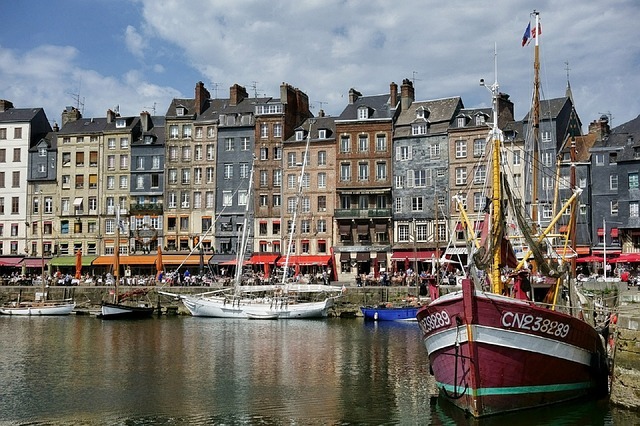 It just seems so much worse when you discover that Honfleur and its fish and chips is the favourite weekend retreat for Parisians. There is a lot of disgruntled mumblings in France about the anglicisation of French everyday life and the French language. We certainly came across a fair bit of English, not only on menus but also in the supermarkets. I can’t say that I blame the French for being upset. Still, there is such a thing as fear of the foreign menu. 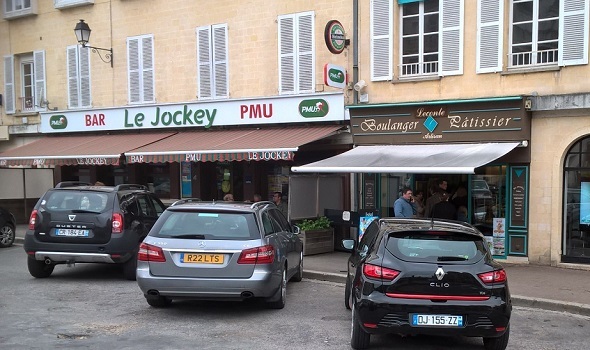 Standing under a leaky umbrella staring at the menu of a Michelin starred restaurant in Falaise, it soon became apparent that we could google until our fingers fell off, but we still wouldn’t have a clue what we were ordering. And anyway, I decided giving my brolly a vigorous shake and getting back in the car to go find a less complicated place to eat, it would most likely be Haute Cuisine. Small portions of meat and two veg in artistic heaps, decorated by strategically placed blobs of stuff that ought to come in serving boats. I have been there before and hail from Industrial Middle England. Plates are for filling, not for fannying about with.